Warmer weather is upon us, and with it comes bad weather, debris hazards, and high winds that all contribute to costly roof damages. Properly preparing your roof for Spring and Summer months will help minimize or even eliminate damages and keep your energy bills as low as possible. Conducting a simple roof inspection can help you identify damages quickly and efficiently. Our Roof Inspection Services Are Quick and Affordable. Now that the snow, cold, and harsh Winter weather has cleared, it’s a great opportunity to climb on your roof and look for visible damages. These could be in the form of damaged or missing material, divots on your shingles or metal, or even asphalt granules in the gutters. Any worn or missing material should be replaced for restored strength. Your gutters are imperative to your roof and your home. When performing your roof inspection, check your gutter system as well to ensure they are able to work properly when needed. 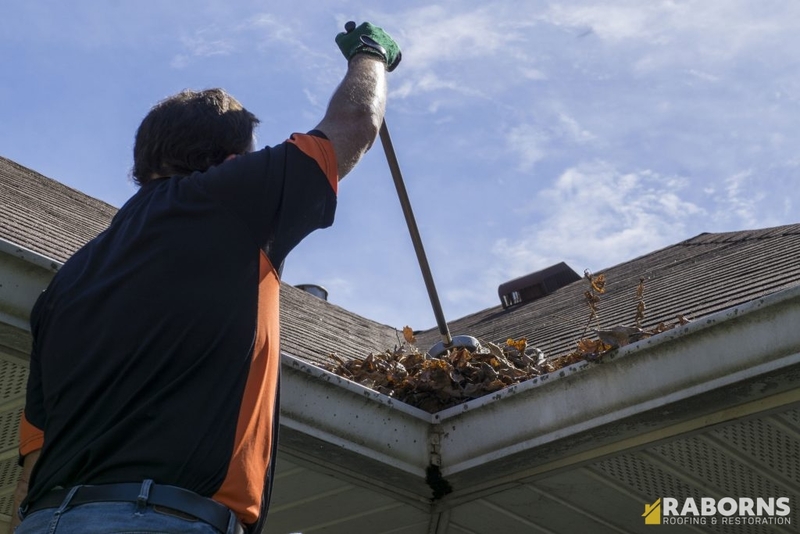 Clean any debris from the gutters to allow proper water flow, and check for weak or damaged areas. These could include holes, separation, or denting at seams that could cause buildup. Also inspect your soffit and fascia, checking for worn or damaged areas that could let outside hazards into your roof and attic spaces. Once your feet are back on solid ground, scan your yard for hazards that could damage your roof in high winds or stormy weather. These could include overhanging limbs and even power lines that could need attention. Be sure to check the underside of your roof and underlayment through your attic. Check for rips, worn areas, and separation that could lead to weather and water entry, decreased UV protection, and insect and critter infestation. Remember that any damages that you find should be repaired immediately to minimize cost and hassle. The Raborns Roofing & Restorations roofers provide comprehensive roof inspection services as well as repair and replacement services for all of your Spring roofing needs. Call our experts today at (706) 814-3207 to schedule your roof inspection or roof repairs in Augusta, GA.
Posted in Uncategorized on February 28, 2018 at 8:26 pm by Raborns Roofing and Restoration.